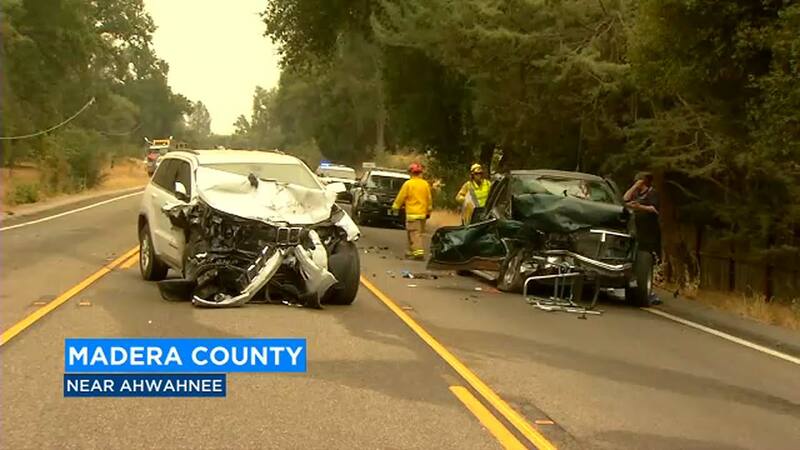 AHWAHNEE, Calif. (KFSN) -- Another person has died as a result of an accident involving a Forest Service vehicle that crashed head-on with a pickup truck in Madera County. It happened Monday on Highway 49 near the Ferguson Fire base camp just outside Ahwahnee. The Highway Patrol said the driver of the Forest Service SUV swerved into the wrong lane. The pickup driver tried to avoid her, but the two vehicles collided. Authorities confirm that the husband and wife in the pickup truck have died. The driver has been identified as Lon Harry Rice, 74, of Mariposa, he died at the scene. His wife, Joan Leota Rice, 87, was airlifted to Community Regional Medical Center with major injuries, but later died at the hospital. The two women in the Forest Service vehicle suffered minor to moderate injuries.